Development only 20 percent complete. The latest issue of Weekly Famitsu has new information on Ace Combat 7, which was announced for PlayStation 4 during PlayStation Experience 2015 this weekend. 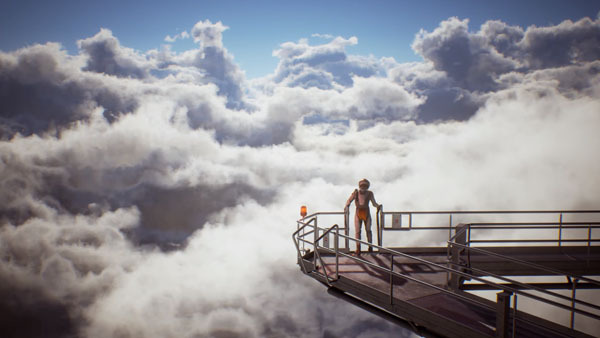 According to producer Kazutoki Kono, the first trailer was entirely real-time, from the pilot to the aircraft and clouds. Ace Combat 7 is set in the same aerial world previous numbered entries were set, called “Strangereal” by fans. They want first-time players to be able to enjoy it, as well. The game has three axes. The first is the depiction of the sky, such as three-dimensional clouds. Clouds are rendered as objects floating in 3D space, not as background scenery, and if you aim for a specific cloud, you can fly through it. The second axis is the enjoyment of airplane simulation. You’ll won’t be performing special moves with the push of a button, but rather maneuvers by strategic piloting. The third axis is improving how you clear missions. Space elevators are a symbol of Ace Combat 7. The large aircraft that appeared in the trailer are fictional airplanes called “FAS” that patrol and protect the space elevator while flying around it. They’re designed by art director Masato Kanno. The space elevator seen in the trailer is so high up that the woman who jumps off has to wear a pressurized suit. Sunao Katabuchi, who did the scenario for Ace Combat 04: Shattered Skies and Ace Combat 5: The Unsung War, is in charge of the scenario for Ace Combat 7. Keiki Kobayashi is handling the background music. Ace Combat 7 will support PlayStation VR. Kono wants a lot of people to be able to play the game intuitively, and being a game where you can fly freely through the sky, virtual reality was decidedly a good match for it. Development on Ace Combat 7 is 20 percent complete. Thanks, Games Talk, [email protected].